About a year ago, Alice Ainsworth and I gave a presentation at Mail camp 2013 about our plans to update the Department of Health (DH) e-newsletter offering. This blog provides an update on how we’re getting on. I’m not really a fan of e-newsletters myself, as they are notoriously hard to do well and without a distinct user need and a clear content strategy they can be an ineffective and time consuming method of communication. Almost all of them don’t work on mobile or tablets. In 2011, 5% of emails were opened on mobiles/tablets, in 2012 that figure had risen to 23% and early statistics for 2013 are reporting figures of anywhere between 40% and 60%. Only 5-15% of people read beyond the first paragraph. Most people will be actively put off any further engagement if the first e-newsletters they receive are bad. Everyone else is sending one too. Click-through rates in the non-profit sector are between 70-99% lower than single-action emails. However, in spite of all of the above, I still needed to find a better solution for the e-newsletters that DH was already running. In early 2013 DH had 16 ‘official’ e-newsletters, all of differing quality, all being delivered in different ways and all being run by various teams in the department. A number of these e-newsletters were coming to the end of their natural lifecycle, either because the policy was moving out of DH and into another organisation in the new health and care system or because to be honest, the stats and effort required to keep them going just didn’t stack up. So it was the perfect time to see what we could do as a Digital team to improve things. an effective delivery tool – quick and easy to use with replicable templates, mailing list management, good analytics and high delivery rates. a clean, simple and responsive e-newsletter design – one that works well on mobile devices and looks inviting, without clogging up recipient mailboxes or being rejected by company IT policies. rationalised and relevant content – short, targeted content that meets user needs eg. their interests, technology and workload, and integrates well with other DH communications. And so, I developed a simple re-usable template in GovDelivery – the tool we were already using to deliver subscription email alerts for our non-Gov.uk campaign and engagement sites. Below is a screenshot of the template being used on our Social care e-newsletter (click on the image to view a larger version), which I am going to use here as a bit of a case study. The template mirrors the design of our campaign and engagement sites, and provides a consistent look and feel across our e-communications. economies of scale – we already had a contract for our email alerts so no additional costs would be incurred. broadcasting tool – we wanted a broadcasting tool which would work alongside the engagement taking place on our blogs/other sites. We may have chosen a different solution if we were seeking to merge these needs. replicable templates - we wanted to be able to reuse templates on other e-newsletters. automated mailing list management - we wanted to reduce or eradicate administrative time spent on manually managing mailing lists. GovDelivery removes dead email addresses and allows subscribers to manage their own subscriptions etc. analytics – GovDelivery measures open rates, click-throughs etc. high delivery rates – GovDelivery is a trusted source. They maintain whitelist status with major ISPs to achieve a 99% delivery rate. One stop shop – as we are already using GovDelivery for email alerts, all our subscription services would be in one place. topic networks – GovDelivery has a large subscriber network which means our subscription services can be offered to subscribers of other organisation’s content and in turn, our subscribers can benefit from relevant content by other organisations too. The template has a single column layout to ensure the design is responsive on mobile devices. And, we have limited the amount of content that authors can add to the template. We allow no more than 10 news items per e-newsletter and these are all displayed succinctly, with a headline, a short intro and a link to read the content elsewhere. We do not duplicate content in our e-newsletters, we merely highlight the content of interest and refer you to the original source for the detail. This ensures our e-newsletters are short and sweet and subscribers don’t need to put aside time to read them later (most subscribers never get around to reading them later). Our Social care e-newsletter, or Social care bulletin as we used to call it, had been running since January 2006. Originally launched to support the publication of the Our health, our care, our say: a new direction for community services White Paper, the bulletin was well received and had a seemingly healthy following, but its delivery method and the administrative processes surrounding its delivery were not ideal. The Social care team spent a lot of time managing the bulletin’s mailing list and the content of the quarterly bulletin was quite long and often repeated what was being said elsewhere. The bulletin was also delivered as a PDF, which was manually emailed out to subscribers and offered for download from the old, pre-Gov.uk, DH website. Aside from download statistics from the DH website and yearly user surveys among subscribers, it was impossible to measure how successful the bulletin or its content really was. And without a fully managed mailing list, it was hard to tell whether the emailed bulletin was reaching its audience. The yearly user surveys and other research undertaken among those working in – or receiving support from – the care and support or social care sector supported the continued need for an e-newsletter. Respondents reported that they wanted to receive regular, targeted, social care news from DH and email was cited as the preferred method of delivery. 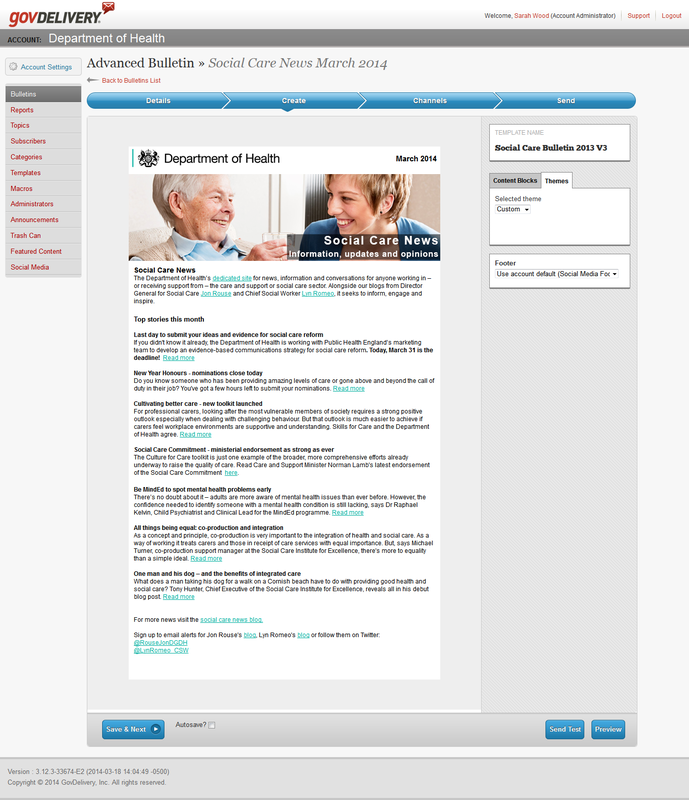 Since launching the new Social care e-newsletter in October 2013, in conjunction with a new Social care blog on Gov.uk, there have been five monthly e-newsletters. Each highlighting relevant content from the Social care blog, other DH bloggers, Gov.uk or sector news. The 5 e-newsletters have achieved an average unique open rate of approx 18% (rates per bulletin ranged from 16-20%). A figure which is well above GovDelivery’s average open rate for the Government sector which currently stands at 11.2% and falls right in the middle of GovDelivery’s average open rate across all sectors, which is 15-20%. Subscriber numbers have also continued to grow month on month and now stand at 10,258. Should this be our problem?